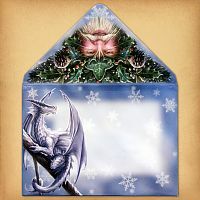 - A wintertime fantasy of holly, ivy, mistletoe and pine. 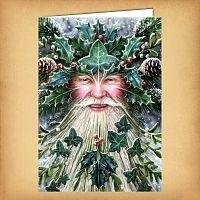 This painting is a combination of the classic green man image and a Santa face to create an all-encompassing Spirit of Yule character. Do you have any other questions about our Spirit of Yule Christmas Card? The Cards are lovely & exactly what I wanted. They are high quality & were worth every penny spent on them. Thanks to Bill at Gryphon's Moon, for a providing a great service with good communication. Also a thumbs up for speedy deliver & well packaged goods! Liked the artwork and design. I can even send this to people who celebrate the "other holiday" and it will still work. 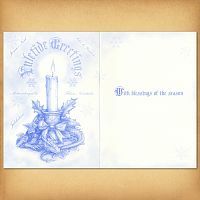 It is so difficult to find quality Yule cards anywhere, either in the stores or on line. I am very pleased with this card. It was well worth the price, as I know the person I am sending it to will not only enjoy it, he will frame it as well. 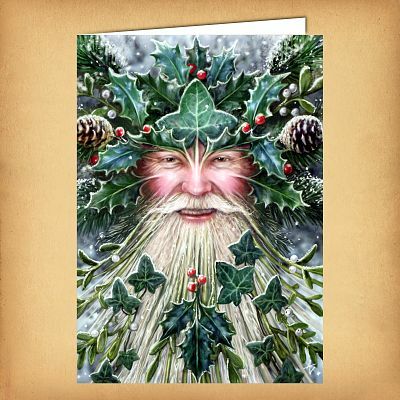 I also purchased several other cards to send to those special people who celebrate Yule also. Each and everyone was beautiful.